Dunk your friend or just about anybody you like. Our dunk tanks are always a hit in hot summer days. Everybody gets pumped up to go in. 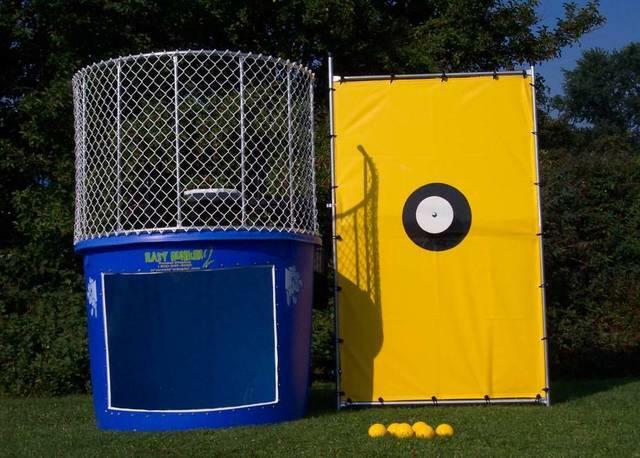 Dunk tanks come with 3 balls and a target where you have to throw the ball at a target to dunk the person into the water. Our dunk tanks have a large clear viewing window to see the person once their dunked in the water. This is a great family or event activity for everyone to enjoy while participating or just watching! Note: Our dunk tanks are commercial grade 500 galon tank, so they are very heavy and can’t be picked up over fences, please make sure you have at least a 6ft opening if you like to have it in your backyard. If you dont have a 6ft opening you can rent one of our foldable dunk tanks. Click here to check Foldable Dunk Tanks out! Our Dunk tanks are new and clean (Guaranteed). Big clear viewing window in the front. Takes about 30-45 minutes to fill.